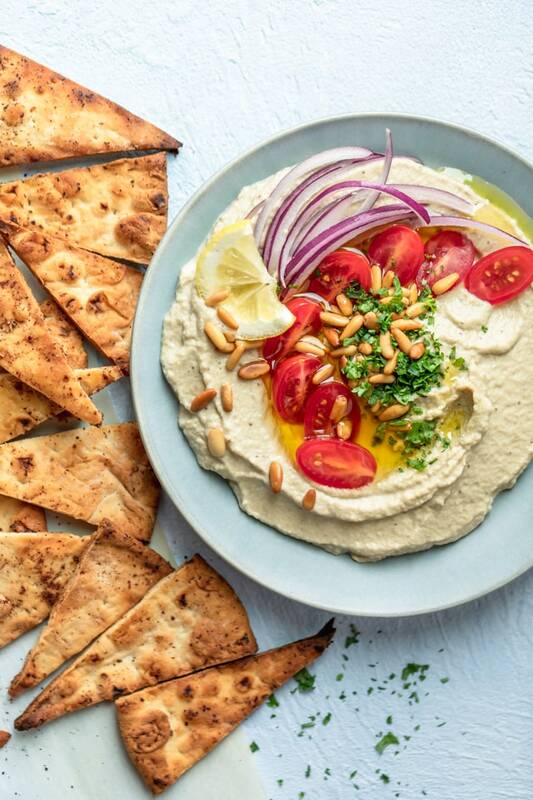 This Lebanese inspired Baba Ganoush is made with only 4 ingredients: oven-roasted eggplant, lemon juice, tahini & garlic - a great alternative to hummus! Hummus gets so much love. But in this blog post, I want you to see why I love Baba Ganoush just as much as hummus! My recipe for Baba Ganoush is one I learned from my Lebanese parents. So if you’re looking to for an alternative dip to hummus, you’ve gotta try this one! 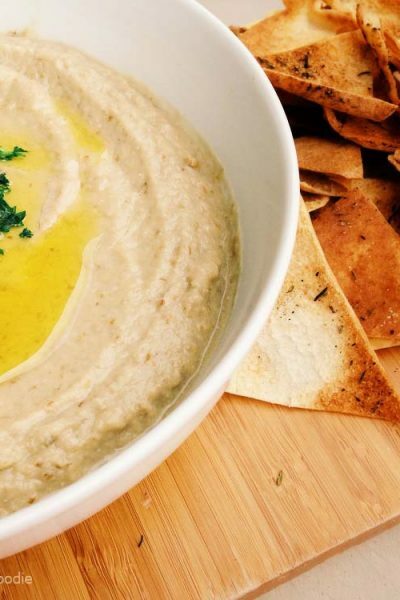 This baba ganoush is an authentic recipe that makes a creamy dip with very little preparation! It’s a tasty appetizer or snack dish that takes 5 minutes to prepare and 45 minutes to smell the eggplant roasting in your oven. What I love about it is the fact that it’s super simple to whip up and that it’s vegan, gluten-free, keto-friendly and Whole 30! Now we’re talking! But first, what is this funny sounding recipe? Well, it’s basically an eggplant dip! No one really knows where the name came from, but in Arabic, baba means father and ganoush means spoiled. Put it together and it’s just really fun to say! You’re going to love this dish as much you’ll love saying the name of the dish! 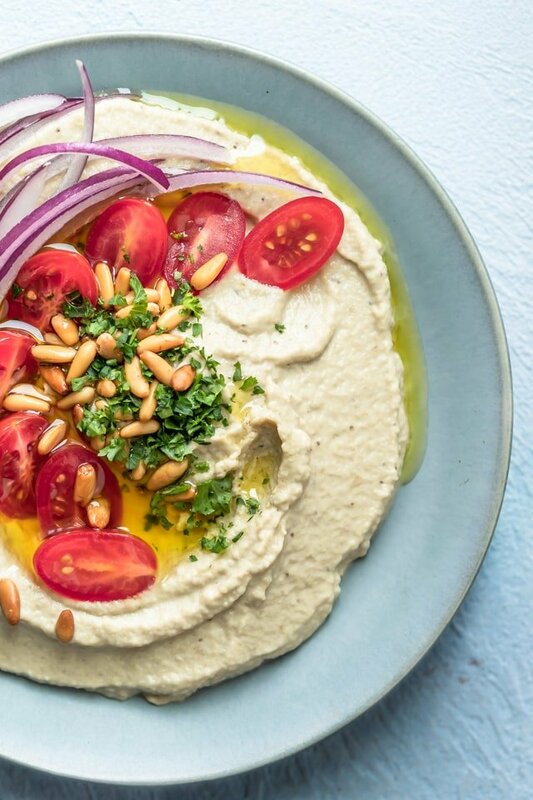 It’s made with only 4 ingredients: roasted eggplant that get sweet and smoky in the oven, fresh garlic, fresh lemon juice and tahini (sesame paste) to bind it all together. 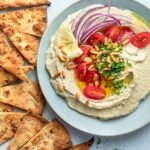 It’s basically like hummus’ lesser known cousin, but it’s just as amazing and just as easy to make! The first step is to roast the eggplant. The traditional way to prepare the eggplant is to bake or broil it over an open flame. That’s what gives it the strong smokey flavor. I opt for the easier faster method of just sticking it in the oven and letting it roast for 45-60 minutes. You’ll still get a smoky flavor and it’s less hassle. You can wrap it in aluminum foil or skip that part. Once it’s soft to the touch and wrinkly, I remove the flesh and pulp to use in the dip, and discard the skin. Next, it’s time to blend it! You can use a food processor or a blender. I’ve tried both and I love how quick and creamy it comes out in the Vitamix (affiliate link). You can literally throw everything in the blender together at once. Or you can blend the tahini, garlic and lemon juice first to get a smooth and creamy sauce and then just pulse the roasted eggplant like I did. When it comes to Baba Ganoush, and actually most Lebanese dips and salads, you can really tinker with the proportions to make it your own. If you love tahini, add a tablespoon or two more to boost flavor and thicken the mixture. You can also add an extra zing of lemon juice to kick up the flavor. Want it more garlicky? Throw in another garlic clove. It’s a highly adaptable dip, so you can taste and adjust to your liking. This Baba Ganoush is totally creamy, super decadent, and has a wonderful balance of smokey and tangy flavor from the roasted eggplant and the lemon. I love that it’s super versatile like hummus. So, it goes really well with pita bread, vegetables, pretzels, crackers or even as a condiment in your favorite sandwich. I always throw this dish in when I’m having a party, and we never have any leftover! If you’ve tried this healthy-ish feel good Baba Ganoush recipe or any other recipe on FeelGoodFoodie, then don’t forget to rate the recipe and leave me a comment below! I would love to hear about your experience making it. And if you snapped some shots of it, share it with me on Instagram so I can repost on my stories! Preheat oven to 400° F degrees. 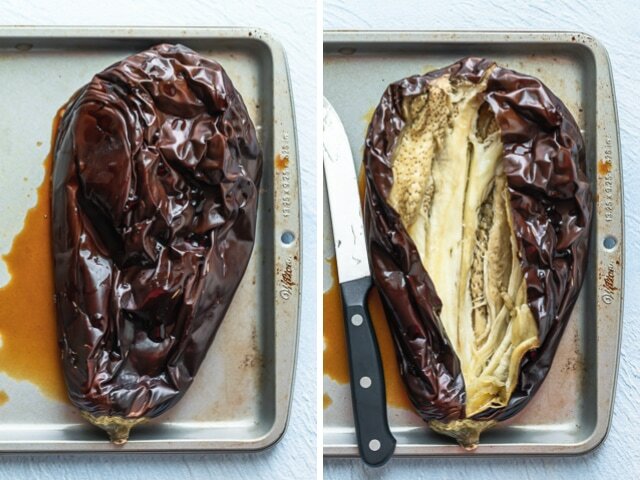 Wrap eggplant in aluminum foil and roast for 45-60 minutes until the eggplant is soft when poked with a fork or knife. Unwrap the eggplant and allow it to cool for 10 minutes. When the eggplant is cool to the touch, cut off the top and peel off the skin. Discard the skin, keeping only the flesh of the eggplant. 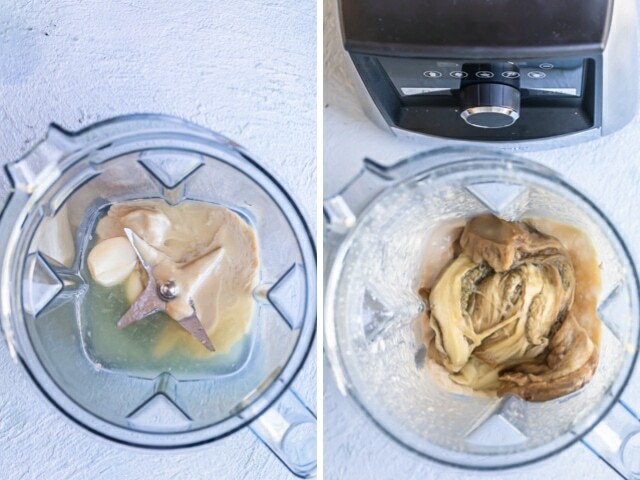 Place the flesh of the eggplant in a food processor or blender. Add the lemon juice, tahini, garlic cloves and salt. Blend for 1 minute until the mixture is smooth and creamy. Alternatively, you can blend the lemon juice, tahini and garlic first, and then add the eggplant. Either way works. Garnish with parsley and olive oil, if desired. Enjoy with pita bread, crudité or crackers. Storage: Store any leftovers in an airtight container. They will last about 7 days in the fridge. Make Ahead: I would recommend making this one day ahead of eating it, or at least a few hours in advance. The dip will get thicker and the flavors will enhance as it cools in the fridge. The easiest part to make ahead though is roasting the eggplant. I recommend roasting it next time you have the oven on or you're firing up the grill. Sourcing: You can find the tahini at Middle Eastern markets, natural-foods stores. Most large supermarkets now carry it as well, often located with other Middle Eastern ingredients or in the peanut butter section. Substitutes: For best results, follow the recipe as is and use only fresh garlic and fresh lemon juice. Appliances Needed: I would highly recommend using a food processor or Vitamix for this to get that creamy consistency super quickly!